As the hangovers wear off and life begins to happen once more the motor industry has to contend with a little piece of bad news that passed almost unnoticed amid the hunt for aunt Gertrude's Christmas present and plans to see in the New Year. After 100 or so years General Motors announced that Vauxhall cars are no longer to be made at Luton, its British home. Feelings run high among the 2000 workers in the factory, and equally among the tens of thousands of contractors and suppliers dependent upon the dying plant for most, if not all, of their income - and not without good reason. Of course none of this has anything to do with Formula 1, does it? Well, in truth, the answer is yes and no. The cost of manufacturing in Britain with the pound on an all-time high is a get-out clause par excellence and GM, like BMW with Rover and Ford with Dagenham before it, has played that particular ace. Amid the wringing of hands among the politicians and the voluble grievances of the work force it is a mantra of absolution for manufacturers. So what does this signal to Formula 1? The correct answer is, of course, absolutely nothing at all. Then again it means nothing to anyone because it's a fib that will, in time, rank alongside that of the prosecution's case against Lee Harvey Oswald. In the lifetime of the car industry our world and its customers have changed beyond all meaning. Life is now structured around things that don't exist, even on paper: we are all surface and no depth. Vauxhall paid the price for that, for the simple truth is that no matter where it was built in the world today you cannot buy a bad car - but you can refuse to buy a boring one. Grand Prix racing has changed in time with the industry that spawned it. A potted history: in the beginning was the word, and the word was nationalism. As Britain, France, Germany and Italy vied to start World War 1, so their car manufacturers competed with technical achievements and bulging order books instead of dreadnoughts and Zeppelins. 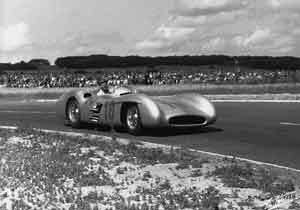 This happened again in the run up to World War 2 but then, when racing cars could run once more, nobody really cared too much. The world had changed and the space race, package holidays, the Cold War and television took over from Grands Prix and, until Bernie arrived, everyone was left pretty well to their own devices. Today we have no need for maps, let alone nationalism. New languages have evolved that need no translation, Communism's gone and we travel the world by Internet. Lifestyle is everything, and here is where the problem lay for Vauxhall - why buy a perfectly ordinary car when Ford will supply you with a sculpture and even a low-spec Volkswagen will say better things about you. So what, I hear again, has all this to do with Formula 1? The simple answer is everything. Bernie made the show and put it on TV. Soon the media devoured the sport, the advertisers got busy and the manufacturers came back with a vengeance. Let the good times roll. Formula 1 has learnt the global language of soundbites; it provides all the right visual stimuli in its locations, its beautiful girls, its beautiful boys and its accessibility through TV, the Net, lifestyle magazines and pop videos. It exists among the most hallowed of entertainment in our surface existence - alongside the PlayStation, blockbuster movies and Hello! magazine. These are, however, precarious times. Say the same thing for too long or the wrong thing just once and in the click of a mouse it could all be gone, just like Vauxhall. For the love of the sport I hope somebody somewhere is making provision for that moment. Once upon a time Grand Prix cars were at the leading edge of design, technology and performance as a beacon for advance. The world grew wheels and traveled faster, more safely and more efficiently because of discoveries made through racing. Now the cars are uniformly beaten with the ugly stick, technically inefficient and offer as little clue to the future of mankind as does a widescreen TV; mere props in a soap opera. Like celebrity motherhood, boy bands and heist movies, Formula 1 is currently riding high and concerns for the future are as relevant as ration books but it's in everyone's interest within the sport to offer something more than tabloid rivalry and marketing spiel. Tomorrow cannot be postponed forever.